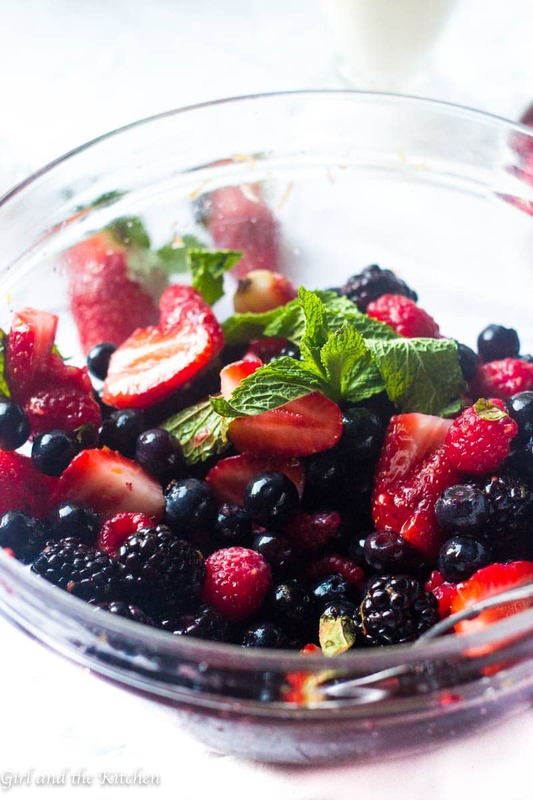 This Macerated Summer Berry Salad is the ultimate dessert for the summer! Perfectly sweet and light it is the ideal accompaniment to any summer BBQ or picnic! Plus learn the trick to incredibly juicy and aromatic berries even when they are not ripe! 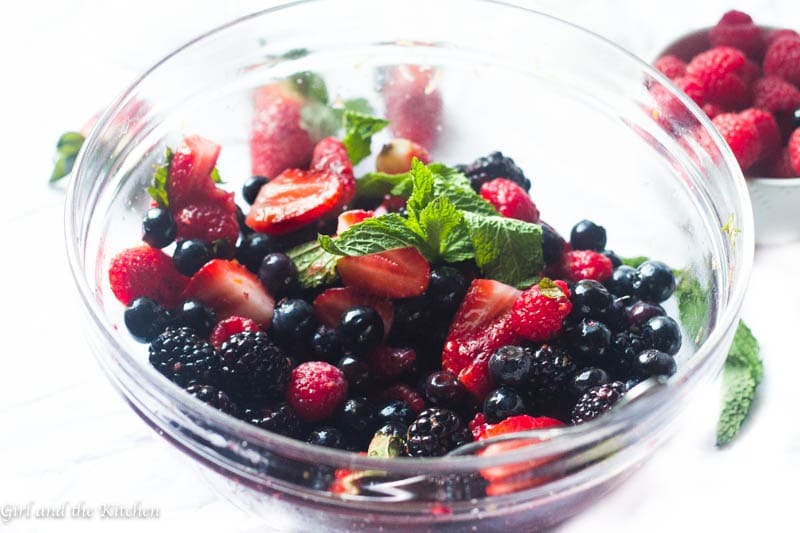 This summer berry salad is seriously the most heavenly dessert that pleases EVERYONE!!! I have been making this salad for about 15 years when I came up with the recipe initially for a last minute summer BBQ I threw. I had relied on someone to bring dessert and they brought beer instead. Naturally. So I was left to my own devices and having had only berries on hand I was determined to make a delicious yet fast dessert that would still be a hit despite my minimal available ingredients. Having had plenty of alcohol on hand, I knew it would be a part of the dessert. Glancing around I saw that my ingredients from my mojito bar (yes my BBQ’s are fancy sometimes) were still a plenty and the sound of mint with berries and some rum just seemed right to me. I sprinkled some sugar, drizzled some rum and tore up some fresh mint leaves into a huge bowl of glistening berries and tossed everything together, hoping that magic would happen in 5 minutes after they had sat and marinated together. And omg magic DID happen. The sugar helped the juice stream out of the berries and combined with the rum it created a dreamy syrup that enveloped the berries in the most delicate way. I found myself nibbling on them one by one…savoring each and every berry. Even the not so ripe strawberries had become deliciously sweet and remarkably juicy! Using Sugar: Regardless of the season, sometimes we run into underwhelming and under ripe berries. My little sugar method helps solve that little problem. When using either sugar or salt, the moisture is drawn out of your food. Think of when you are trying to cure anything, such as lox for instance. The salt and sugar that is pressed onto the fish draws out all the moisture. The same occurs here. The best part of course is that we do not need a lot of sugar, in fact just a few tablespoons are all that we need to get perfectly juicy and glistening berries. The best part of course is because the salad gets better as it sits a bit…this is the IDEAL FOR MAKE AHEAD!!! Hulling and Cutting the Strawberries: I like to take the large strawberries that I tend to have on hand and quarter them because it exposes the insides and allows the juices to come out even more. I prefer to remove the stems because it just makes it that much easier to eat this salad. Years ago I stumbled upon this little strawberry hullerthat has been my LIFE SAVER! It makes my life so flipping easy and it is so fun to get the kids involved in helping you remove the stems from the strawberries!!! It’s actually kind of therapeutic! Alcohol: In my original recipe for my summer berry salad I had used rum. However, I have since used Cognac, Grand Marnier, Bourbon, Whiskey, Limoncello, Port, Marsala Wine and even vodka. The best of course were the different liqueurs but in reality they all work. They help create a sweet sauce on the berries that truly enhances their natural flavors. Mint: The mint in this recipe adds that special “what’s in there” note that makes this summer berry dessert so very memorable. It also really brightens up all the berry notes and freshens everything up. The mint lingers on your palate almost as an after thought and really leaves a memorable impression! 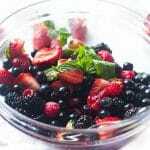 I have served my summer berry salad over store-bought sponge cake, as a garnish for creme brûlée ,as a topping for my Swedish Pancakes and more simply, over classic vanilla ice cream. It has been a hit EVERY. SINGLE. TIME. This recipe has yet to fail me and frankly yet to disappoint anyone. 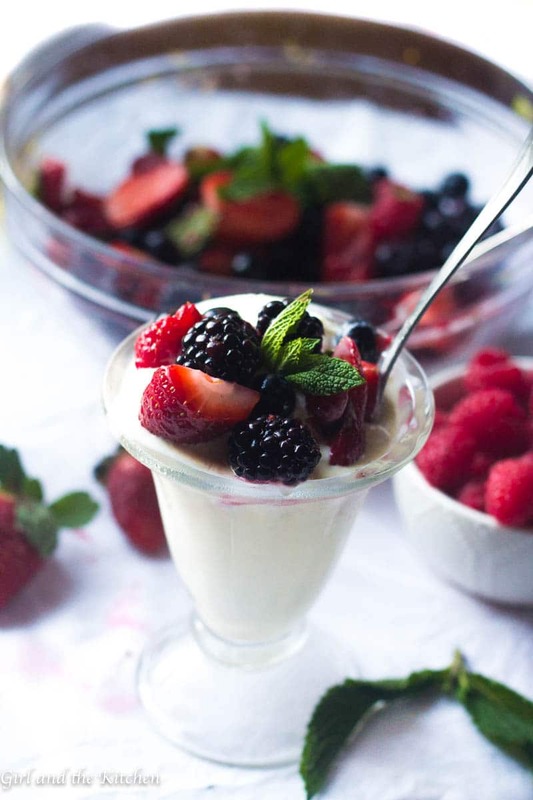 Plus when it involves practically no work and is even better when made ahead…I hardly think that ANYTHING can really beat it out for a summer dessert that is not only delicious but healthy! 16 oz fresh strawberries cut in quarters. Combine all the ingredients in a bowl and mix. Allow to stand for at least 15 minutes and up to 8 hours. Serve plain or over ice cream, store bought cakes or with any custard as a garnish.